In website years, that's incredibly old. Technology and all advances so quickly. When I first started AQ, the most popular browser in use was Internet Explorer 6. And I hated that browser for so many reasons, but one of the biggest reasons was its lack of support for alpha transparencies on PNG images. A lot of you probably don't know what that means and that's okay--you don't have to understand it. It didn't help much that none of my paint programs really supported it either. So AQ became littered with GIF images. Even worse, when I started Atlas Quest, I had absolutely ZERO income. No job, no premium memberships, no nothing. My biggest financial windfall in 2004--the year I started Atlas Quest--was when I invested a few thousand dollars in Martha Stewart's company immediately after she was found guilty of insider trading. I bought some of her company then, and it went on to do very, very well over the next several months and I eventually sold it just before she got out of prison. As exciting as that was, however, it's not a windfall I could expect every year! And I felt it was finally time for a major icon facelift! I've been using some of the same icons on AQ for over ten years now, and it needs a refresh! So that's what I'm in the process of doing now. There are some lovely icons too. High quality, top-notch icons. I have them in multiple sizes so I can use tiny little versions where needed, or huge icons that could be used as a menu button. 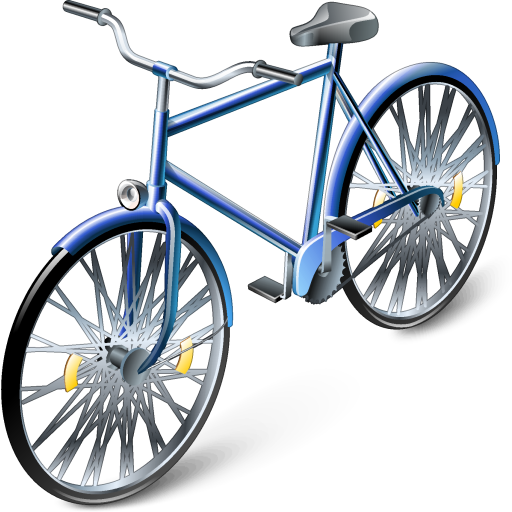 This is the bike-friendly icon. It will NOT be this big on the live website! But I'll have versions of all the icons up to this size so I won't be limited to a one-size-fits-all scenario. I kind of like the "freshly hatched egg" to represent a new member, but my icon set didn't include any eggs. (Not even sunny side up eggs! *gasp*) But it did have this pacifier. I'm not actually sure how I feel about using a pacifier to represent a newbie, but it seemed like the best choice of the options available. But I digress.... When I started working with these icons, I had no idea how to "engrave" the trophies and I spent three full days learning all sorts of new tricks with my photo-editing software to create these effects! And I decided that I also wanted to spell out the entire number--just just the first digit like the existing icons do. But the thin little trophies provided just didn't have enough space for up to three numbers at the same time, so then I had to digitally manipulate the silver trophy to be just a bit wider than the bronze one, and change the gold trophy to be wider still. More for me to figure out and learn! Which actually worked out pretty nicely because the trophies don't just change color as you level up, but they get BIGGER too! But in reality, the main reason I made them bigger was to fit the larger numbers on them. And unlike all of those other icons where I just needed one icon, I had to create 27 different icons for this because it's part of a set--one for each number I needed. (i.e. 1, 2, 3, 4, 5, 6, 7, 8, 9, 10, 20, 30, 40, 50, 60, 70, 80, 90, 100, 200, 300, 400, 500, 600, 700, 800 and 900). So I had to apply the text affects, and curve the text around the trophies for nearly THIRTY different icons! These new icons look great! Thanks for keeping the site looking so spiffy. Nice! Looking forward to the new icons.